For the stock or index fund investor, it is important to maintain a feel for the prevailing market conditions. Whether one pursues a regular “buy and hold” or a more sporadic approach to stock investment, one should always be aware of the inherent risk and potential returns that the market has to offer; and your investment strategy should constantly adapt to meet these conditions. Market averages such as the Dow Industrials or S&P500 indices are the most readily available barometers for market conditions. 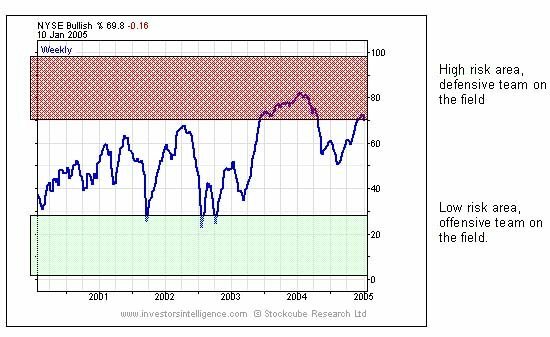 Using charts, it is relatively straight-forward to determine the current index trend, and to identify how long this trend has been in place. However, what is more beneficial is to have an understanding of the underlying strength of these market trends as this will go some way to determining the likelihood of the trend changing and the relative levels of market risk. Breadth indicators were developed precisely with this task in mind: to determine the strength of a market trend by looking at the trends of its constituent stocks. The first breadth indicator, the NYSE Bullish Percentage, was developed by Abe Cohen, the founder of Investors Intelligence in 1955. He was an early pioneer of point & figure (p&f) stock charts and these provided the ideal building blocks for a market barometer. By recording stock prices, p&f charts effectively map out the relationship between demand (buyers) and supply (sellers). The advantage of p&f charts is that these supply/demand imbalances are clear cut and easy to identify: if demand outstrips supply, a p&f bull signal is generated and if supply outstrips demand a p&f bear signal is generated. Abe Cohen took the logical leap that by calculating the percentage of bull trends amongst the constituent stocks of the NYSE index, he would have an accurate picture of the supply/demand relationship for the market as a whole. For example, if there were 2000 stocks in the NYSE index and 1000 of them were on bull signals, then the Bullish % would be reading 50%. As it turned out, not only did the NYSE Bullish % identify periods when the bulls were in the driving seat i.e. the best time to buy stocks, but it also proved to be a one of the best contrary indicators for calling intermediate market tops and bottoms. Probably the best and most common analogy applied to the NYSE Bullish % is that of a football game: level of the bullish % represents the current field position and the “end-zones” are above 70% and below 30%. Almost everyone who wants to sell has already sold. Once the “play” starts moving up from this area (indicated by reversals on the p&f chart of the bullish %) it is time to start playing the offense i.e. aggressively buy stocks, even volatile technology names and attempt bottom-fishing in stocks at multi-year lows. When the indicator moves up into mid-field, continue to play the offense but buy more selectively in stocks with strong relative strength. Begin to take profits in recovery plays and holdings with weak relative strength. Buy new positions on pull-backs. When the “play” starts moving down from this area (indicated by reversals down the p&f chart of the bullish %) it is time to initiate defensive tactics. Sell any laggards (with weak relative strength). Begin to tighten stop loss points on all holdings. Focus new positions in defensive/lower beta sectors. Use ETFs instead of individual stocks to reduce volatility. Buy call options instead of stock to limit equity exposure. Abe Cohen’s original strategy for the bullish percentage was to be bullish on readings above 52% and bearish below 48%. However, as time went by, and the back history of breadth data built up, improved applications of this indicator were introduced. Earl Blumenthal’s book “Chart for Profit”, published in 1975, introduced a series of rules to be applied to the point & figure chart of the NYSE Bullish % or the “Bullish Bearish index” as he referred to it. The rules were further refined by Mike Burke in 1982, when he became editor of Investors Intelligence, and remain to this day the recognised method of applying breadth to market strategy. 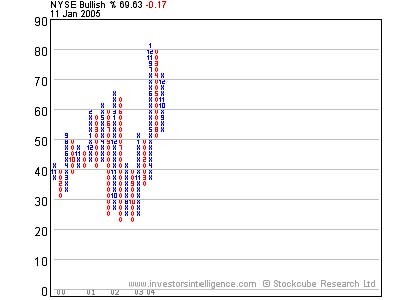 Bull Confirmed – chart is on a p&f buy signal and is rising (column of x’s); and/or is in a column of x’s above 68%. Bear Confirmed – chart is falling (column O’s) below 70% and has generated a p&f sell. Bull Correction – chart is on a p&f buy signal but is falling (column of O’s) without yet reaching 70%. Bear Correction – chart is on a p&f sell but is rising (column X’s) without having moved above 68%. Bull Alert – chart rising (X’s) moving up from below 30% but has not yet generated a p&f buy. Bear Alert – chart is falling from above 70% to below 70% without yet generating a p&f sell. Bull Top - chart is falling (column of Os) but above 70%. The chart below shows the current p&f chart for the NYSE Bullish %: the chart is currently on a p&f buy signal hence is showing bull confirmed status for the market. If the indicator were to move down below 70% is would move to bear alert status. A move below the previous down column of Os at 50% would be required to move it to bear confirmed status. In the early 1970s, Investors Intelligence introduced further breadth indicators that reflected the percentage of stocks above their 10 week (50 day) and 30 week (150 day) moving averages. These indicators provided an alternative method of defining a bull trend and proved to be more sensitive to market moves. The charts below highlight the increased sensitivity of the NYSE % 10 week moving average indicator compared to the NYSE Bullish %. 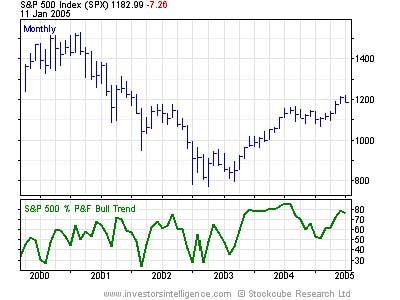 Note the sharp down-move that began in January 2005 for the % 10wk indicator which has not yet been seen by the bullish %. Since their introduction, the moving average based breadth indicators have become the leading indicators, and the role of the bullish % has become one of a confirming indicator for medium term trends. The NYSE index, with over 2000 constituent stocks, remains a good broad “universe” for measuring general market breadth. The NYSE bullish % has now been calculated for over 50 years and in the early days, before the dawn of computers, was calculated using hand-drawn point & figure charts of the constituent stocks and adjusting the bullish % figure for changes in the number of stocks on bull signals. This extensive back-history provides many precedents for signals generated in all sorts of market conditions. The Nasdaq was founded in 1971as an electronic marketplace for over the counter (OTC) stocks and rapidly developed as the home for emerging technology and growth stocks. Breadth indicators provide an excellent timing tool for this market. For small cap investors, breadth indicators based on the Russell 2000 and Value Line Composite are the most appropriate tools. Breadth indicators are also available for the S&P indices. This is particularly useful as a timing tool for “style” investors as one can compare the breadth indicators for the large cap S&P500, S&P Midcap 400 and the S&P Small Cap 600. The S&P Composite 1500 index is a conglomeration of stocks from the three indices and since it covers stocks from the NYSE, AMEX and Nasdaq provides a viable alternative to the NYSE breadth indicators. The introduction of exchange traded funds (ETFs) has provided investors with an efficient vehicle for investing in the above indices thereby offering exposure to a diversified basket of stocks that would be difficult to achieve by direct stock investment. Using the breadth indicators for the relevant underlying indices can provide a valuable tool for the timing of ETF investments. Investors Intelligence regional services now offer breadth indicators covering markets such as the UK (FTSE 100 or FTSE All Share constituents), Europe (the “All Europe” breadth indicators measure breadth of all major European index constituents), and Japan (the Topix 100 or Nikkei 225 breadth). The aim of this article has been to highlight the benefits of breadth indicators as a market risk measurement tool and to introduce the concept of tailoring one’s investment strategy to meet the current risk/reward characteristics of the market. Whilst the Bullish %s and other breadth indicators were largely developed by the point & figure community, we firmly believe that this powerful form of analysis should have an appeal to any investor with market exposure. The Investors Intelligence site displays breadth charts in a variety of formats and our daily hotlines communicate changes in breadth status and suggested strategy in a comprehensive manner.